Want to see the next big things in technology and innovation? 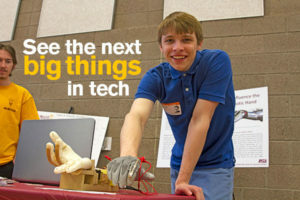 The Innovation Showcase is a massive exhibit of ASU student-produced projects, demonstrating how ASU students solve real-world problems with innovative and imaginative solutions. Collaborating with industry partners both in the greater metropolitan area and the world over, students work on creating solutions to meet tangible industry and societal needs. Innovation Showcase enables creators to produce, refine and develop new inventions, new methodologies, new creations and new ideas. Find out more information about the Innovation Showcase.